There are 3 different types of online coupons on Rather-Be-Shopping.com. The first type is a coupon code promotion where you actually have to enter the code when "checking out" from the retailer's website in order to get your discount. The second type we call an embedded coupon, which requires no coupon code. You just click on the corresponding link and the coupon discount will automatically be applied to your purchase at checkout. The last kind we call a deal/coupon link which also has no coupon code attached to it and is often a site-wide promotion that the retailer is currently offering. To help even further, we made a video tutorial on the 3 different types of online coupons. Find the coupon you want to use on Rather-Be-Shopping.com and click on the corresponding link or coupon code. By clicking on the small banner that reads 'Click to peel and copy code' it will not only open a new browser window and load the retailer's website, but will automatically copy the coupon code so all you have to do is type Control+V to enter the code into the coupon code box at checkout. The location where you enter your coupon varies by the retailer. You will be prompted to enter your coupon code anywhere from the 'shopping cart' page to the 'billing' page. Look for a box saying coupon code, promotional code, promotional discount, discount code, or any variation of these and enter your coupon code in the corresponding box. IMPORTANT - Whichever type of coupon you end up using, always make sure your discount/coupon is reflected in your order total before you confirm your purchase. Darn right it is! Completely free. Free to use and free to register. So tell all your friends and don't forget your Aunt Mabel who finally got on the Internet last month. If you register you can do some really cool things. The first thing you can do is save coupons to your account for quick retrieval in the future. 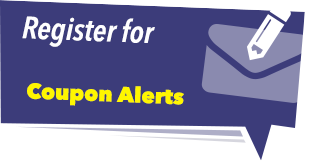 But the best feature is you can sign up for free 'Coupon Alerts' (Video Tutorial) which allows you to pick your favorite stores and shopping categories and get a friendly email from us when we add a coupon that fits your criteria. Funny you should ask. Just click here: Register Now! Where Do You Get All The Coupons? Stores send them to us to post, we go out and scour the Internet for them, and friendly users like you E-Mail them to us when they stumble across them. Hint, Hint. How Do I Know Where To Enter My Coupon Code? Do You List Free Shipping Coupons? With gas over $4.00 a gallon, we absolutely have a Free Shipping Coupons page! We add to it everyday with new coupons so you can keep the car in the garage and shop in your pajamas from home. Finally, please Contact Us if you have any questions on using coupons on the Internet. We look forward to helping you save a few bucks.